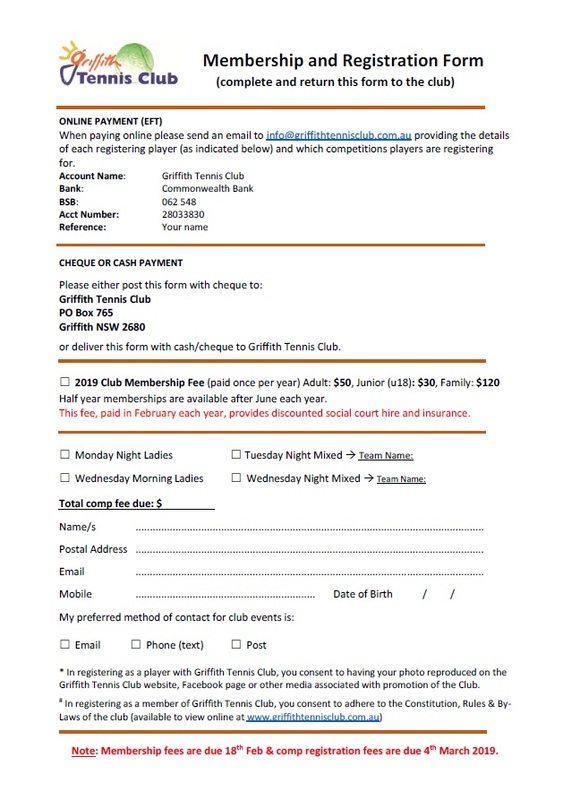 Bookings and payment for casual hire of the Griffith Tennis Courts can now be made online, using the Book a Court system. Visit the Book a Court site to create your online account to make bookings easier! NOTE: After making a booking, your PIN code will take 10 minutes to activate, so if you can, book at least 10 minutes before the time you want to access the courts. If you are a regular social user of the courts, why not become a member? We have full year (from January) or half year (from June) membership options available. 2018 Membership fees are: Adult (full year) $50, Adult (half year) $25, Junior (under 18, full year) $30, Junior (under 18 half year) $15, Family (full year) $120, Family (half year) $60. Simply fill in a membership application form and return it to the Club, either by email or post as directed on the form!